Seven fantastic ways to transform rubbish into storage | How can I recycle this? I don’t know about you but I’m itching to get a start on spring cleaning this year – or rather spring decluttering – and as well as getting rid of a whole bunch of stuff, I’d like to have better, neater storage for the stuff I have. We have approximately eleventy-hundred tons of paper in the house at the moment – even if half can be thrown away, that’s a whole lot of stuff that needs filing. 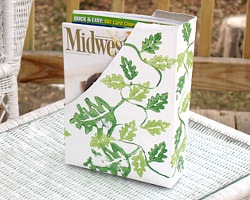 Cereal boxes make quick and easy magazine holders – for magazines, notebooks or just papers. Paint them or cover them with pretty paper (or newspaper for a more modern look) to coordinate with your decor/hide your addiction to Coco Puffs. If you need them to be a bit sturdier, it’s also easy to make your own magazine files from scratch from any scrap cardboard. Lee Meredith turned some coffee cans into fun wall mounted yarn storage – and the same principle can be applied to any cans. They can also attached in the same way but mounted vertically to store other things – like pens, paintbrushes or kitchen utensils. Old magazines or newspaper can be transformed into storage in a number of different ways – layered up to make mini-hat boxes, coiled into open bowls, or woven into a useful open box for storing … more newspapers. A basic reuse but a goody! 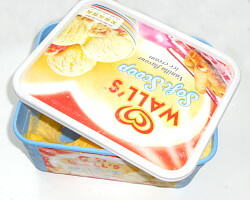 The bits of our lives which are already sorted involve ice cream boxes or shoe boxes – packaging that’s sturdy and regular in shape so easy to stack. I use a lot of shoe boxes for craft supplies and in the bedroom – my winter hats live in one through the summer, my tights live in another for the 364 days a year when I wear jeans, my odd socks live in another ahead of repairing. They all hide in my wardrobe/drawers but if they were on show, I could easily paint them or cover them with paper. Old ladders – ones that are a little knackered so not safe enough for climbing – make great shabby chic shelves. You can hang then vertically as a towel rack or you can use them with some other scrap wood to make a bookshelf. Or you can hang them horizontally for longer knick knack shelves. 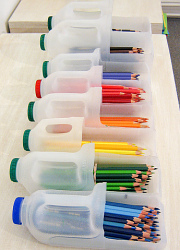 I’ve featured these before but I still love the idea if you’ve got a lot of pencils, pens or that sort of thing – use plastic milk bottles to make grabbable storage boxes. I love hooks – they let us get our junk up out of the way – but there is no reason why they have to be boring. How about some very cool coat racks using old cutlery for the hooks (or just stand alone hooks with the same principle)? Or perhaps you’d prefer fun but creepy using old doll parts? Staying with the hanging theme, use old piping to make a feature wall-mounted pan rack – or just a hanging-anything rack really. Do you have any other great upcycling suggestions we should add? We’ve recently got our kids into stamping and making their onw cards. The cereal box magazine files look great and for them to try. They might even help keep their homework desks a bit more tidy! My girl had comic books and magazine she wanted to keep. We made cereal box magazine holders and covered them with the sunday newspaper funnies. And tiny clear plastic boxes-the kind candy and mints sometimes come in- are nice for storing small beads and such. Oh, I’ve got plenty of ways to use old stuff. Another one that I was thinking I should post is my vegetable trellis made out of old bicycle wheels. When I have to mail out a book (big fan of Book Mooch) I use cardboard from cereal boxes. The conform to the book’s shape easily, are more durable than brown craft paper and add very little additional weight to the package.